Morocco was the favorite winter retreat of Sir Winston Churchill, Britain’s legendary World War II leader. He considered the Moroccan city of Marrakesh to be “the most lovely place in the whole world.” In January 1943, the British prime minister and U.S. President Franklin D. Roosevelt met secretly in Casablanca, a momentous conference that set the course for the rest of World War II. 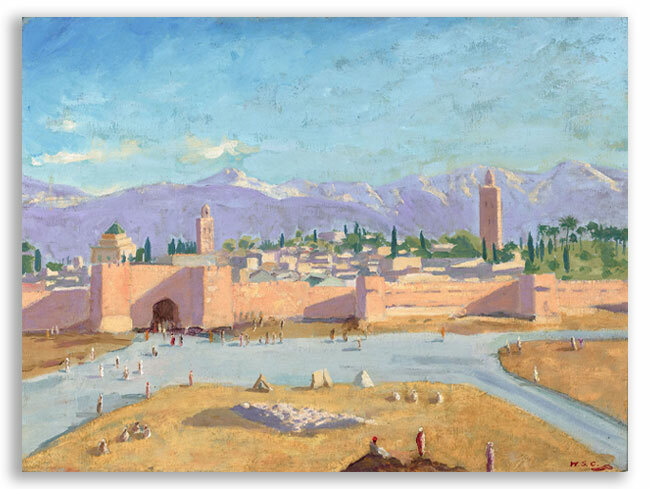 Churchill’s significant ties to Morocco will be the topic of Monday’s opening lecture for “Magic of Morocco,” this year’s 3D Journeys travel and lecture series at LaGrange College. 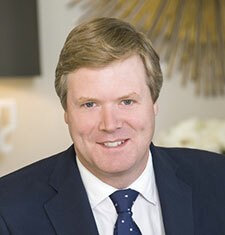 Duncan Sandys, a great-grandson of Winston Churchill, will be speaker. The lecture, free and open to the public, will be at 10 a.m. in Dickson Assembly Room of Turner Hall. Married to a Georgian and now living in Atlanta, Sandys (pronounced Sands) plans to share “amusing stories” gleaned from family letters as well as observations on Churchill’s numerous trips to Morocco, including the historic wartime meeting with Roosevelt. The Casablanca Conference and side visit to Marrakesh, Sandys said, “were key to some critical decisions that were taken,” and also were where the two leaders “forged the personal bond” crucial to their war-time collaboration. LaGrange College President Dan McAlexander feels Sandys’ lecture will get the 3D series off to a stirring start. Travel to Morocco is also on the agenda for almost 30 3D travelers who will visit the north African country this spring on a trip led by McAlexander and Celeste Myall. The four annual lectures are open to travelers and non-travelers alike, and a majority of the audience is made up of lifelong learners who do not take the optional trips. Steve Griffin of LaGrange is among that group. Sandys, who has numerous business interests, is also a frequent speaker on leadership, current affairs and international trends. In 1998 at age 24, he was elected against the odds to Westminster City Council in central London where he served for more than a decade and was the youngest Lord Mayor of Westminster. He describes himself as “always surprised and humbled” that decades after Churchill’s death, people continue to have such great interest in him. If you go: For Monday’s session and all others, park at Sunny Gables Alumni House, 910 Broad St., for shuttle transport to the door. An optional Dutch-treat lunch is available at Pitts Dining Hall following all sessions. For additional information, call 706-880-8244 or email 3DJourneys@lagrange.edu. The other 2019 speakers and lecture dates are Dr. Kevin Shirley, history professor, Feb. 25; Dr. Dottie Joiner, art history professor, March 25 and Dr. Caleb Williams, exercise science professor, April 22. The Panthers (13-4, 9-1 USA South) won their seventh-straight game, winning 84-80 at Huntingdon on Wednesday. Sophomore Gary Bishop and senior Jamison McCray led LC with 16 points, while Travis Thompson had 13. Jalen McCallum had a double-double of 12 points and 10 rebounds, along with seven blocked shots. The Panthers (10-9, 4-6 USA South) lost 73-70 in overtime to visiting Piedmont on Wednesday. Senior Marilauren Farr led LC with 22 points, while sophomore Jahpera McEachin added 14. The LaGrange swim teams swept a dual meet at Warren Wilson last Sunday. The men won 83-55 and the women 61-57. Aatiq Bradley, David Edmondson, Gabriel Griffith and Craig Kennedy each won two events. Lyllie Menjivar-Couch and Alex Bromby Flippen tied for the women’s high points, with each winning two events. Jan. 26 – Swimming at Emory & Henry, 5:30 p.m.
Men’s basketball at Pfeiffer, 2 p.m.
Women’s basketball at Huntingdon, 3 p.m.
Jan. 27 – Men’s basketball at William Peace, 1 p.m.
Jan. 28 – Baseball varsity reserve at Georgia Highlands. 5 p.m.
Jan. 29 – Women’s basketball at Agnes Scott, 7 p.m.
Jan. 30 – Baseball varsity reserve vs. Oglethorpe, Cleaveland Field at Williamson Stadium, 5 p.m.
Jan. 30 – Men’s basketball varsity reserve at West Georgia Tech, 7:30 p.m.
Members of LIFT (Leaders Inspired for Tomorrow) worked Thursday to put together care packages they had gathered during Jan Term. 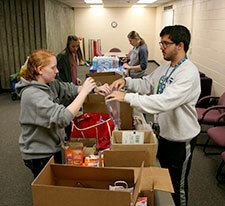 The bags contained personal care items like toothbrushes, toothpaste, deodorant and soap; socks, gloves and hand warmers; and snacks and bottled water. They will be delivered for use at the LaGrange-Troup Homeless Coalition’s Warming Center. Teaching English to Speakers of Other Languages instructors will be on campus this weekend for professional development and training, as well as recruitment. Joseph Miller, Vice President for Enrollment and Dr. Colby Jones, Assistant Professor of Education, assisted in coordinating the event, and will be on hand to discuss the college’s TESOL major. College housing will open for Spring Term on Wednesday. The first day of classes is Friday. Don’t forget the Faculty and Staff Appreciation Luncheon at 11:30 a.m. Thursday in Pitts Dining Hall. Registration is open for this year’s Spiritual Life Service-Learning spring break trip March 29-April 4 to Big Pine Key, near Key West, Florida, to do hurricane recovery for those rebuilding after Hurricane Irma. This will be a week of worship, work, play and learning in the Florida Keys. Space is limited to 20 students. Total cost per student is $200, which includes airfare, lodging and most meals. Student applications will be open until Monday, and a $100 deposit will be due on Feb. 1. Visit here to apply.